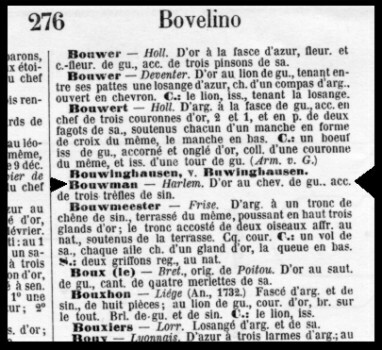 " BOUWMAN" means: "man who tills the land" Or in Dutch: "man die het land bebouwt". 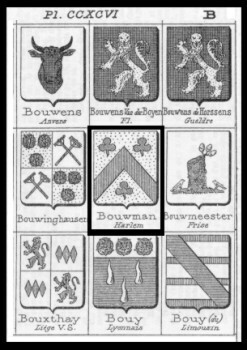 The above illustrations have been copied from the "RIETSTAP'S ARMORIAL GENERAL"
created for a Bouwman Family in Haarlem, Noord-Holland, Netherlands. D'or au chec. de gu., acc. de trois trefles de sin. Trefoil means "three leaves", usually a clover. Trefoils are used for many different coat of arms. and certainly not all people having that name are blood related. describe their profession when they went to other countries. in Haarlem can make a claim that this Coat of Arms is theirs.